Kids across America are growing, and some are earning, a lot of “green” participating in the National Bonnie Plants Cabbage Program. This year, more than 1.5 million third graders in 48 states have gotten hands-on gardening experience growing colossal cabbages with high hopes to win “best in state” and receive a $1,000 scholarship towards education from Bonnie Plants. Each year Bonnie Plants, the largest producer of vegetable and herb plants in North America, with 72 stations across the country, trucks free O.S. Cross, or “oversized,” cabbage plants to third grade classrooms whose teachers have signed up for the program online at www.bonnieplants.com. If nurtured and cared for, kids can grow green, giant cabbages, some tipping the scales at 40 pounds! Launched nationally in 2002, the program awards a $1,000 scholarship to one student in each participating state. At the end of the season, teachers from each class select the student who has grown the “best” cabbage, based on size and appearance. 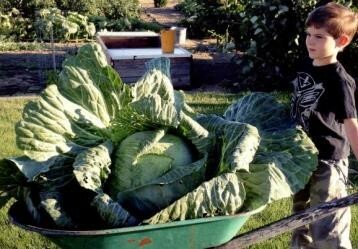 A digital image of the cabbage and student is submitted online at www.bonnieplants.com. That student’s name is then entered in a statewide drawing. State winners are randomly selected by the Commission of Agriculture, in each of 48 participating states. • Let the Sunshine In: Cabbages need at least six hours of full sunlight, more if possible. • Survey Your Space: Bonnie O.S. cabbages need at least three feet on each side to spread out. If you don’t have that much space, use a large container. • Supplement Soil: Work some compost into the soil – cabbages love nutrient-rich soil. • Feed the Need: Start your cabbage off right with an all-purpose vegetable fertilizer, then fertilize it every 10 days to keep it growing strong. • Water Wisely: Your cabbage needs at least one inch of rainfall each week. If it doesn’t rain, use a watering can or garden hose to gently water your plant at soil level. • Tend To Trouble: Keep weeds out of the cabbage patch – they compete for the food and water your cabbage needs. Be on the lookout for brown or white moths – these come from worms that love to munch on cabbage. If you see any, get rid of them right away. Cold weather can damage your cabbage. If the weather gets below 32° F, cover your cabbage with a bucket or clothe covering. • Hefty Harvest: In just 10 to 12 weeks, you should have a huge head of cabbage you can be proud of. Photo: Jonavin Barta, National Bonnie Plants Cabbage Program Washington State winner.